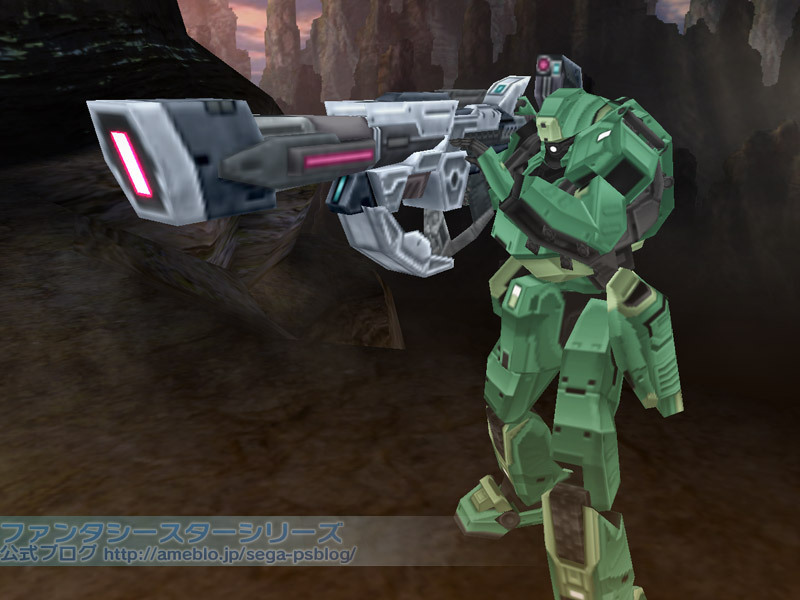 Sakai updated with a brief blurb about PSU Japan’s newest update, Border Break Air Burst. The last time we saw Border Break was when PSP2i characters and weapons showed up in their game. This time the collaboration has extended to PSU with much higher quality models. Hobbystock is selling their Sega Heroine Collection Trading Strap, featuring popular female characters in Sega’s history. 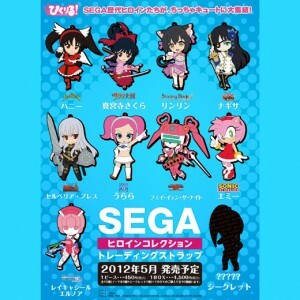 Each piece costs 450 yen, but the whole box set is 4,500 Yen. The release date appears to be around May. Today 2/24/ marks Infinity’s one year anniversary, but also PSP2 Japan Internet Multimode service has now ended. For PSO2’s voice actors we have to make a correction. The meaning behind this phrase “入れ替わる” is actually “changed places” instead of “replaced”, or in the sense, they replaced each other’s positions. 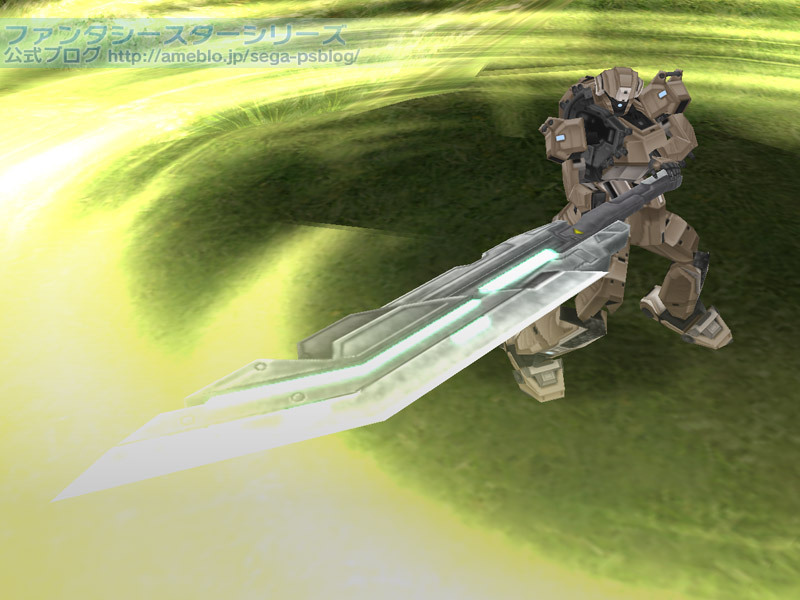 Basically a voice actor who may have done a minor role in the past Phantasy Star games could do a prominent role in PSO2. Or, a voice actor who played on the antagonist side could play the protagonist and vice versa. It doesn’t rule out new voice actors from appearing, but if you’re expecting Rie Tanaka to return, she could possibly have one line this time or something. 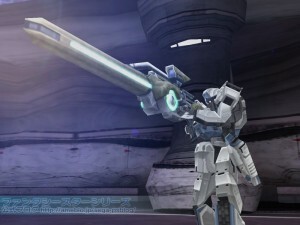 PSO2 will be playable at this year’s Dengeki Game Festival which starts March 18, 2012. It looks like they’ll use an Alienware Desktop machine. I wonder why.. 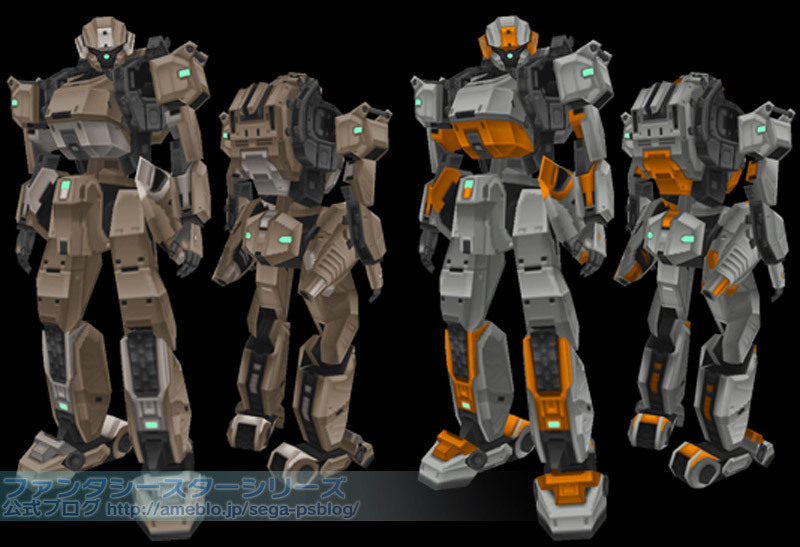 Yet another RaCaseal Plastic Modeling kit is coming out. 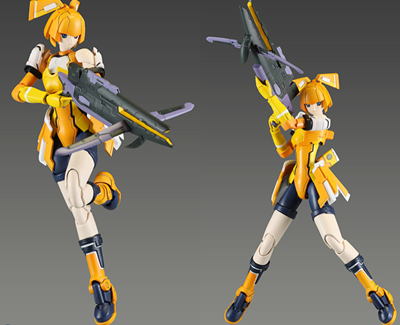 First we saw Elenor, Shino, then Whitill, and now she’s all decked out in yellow. 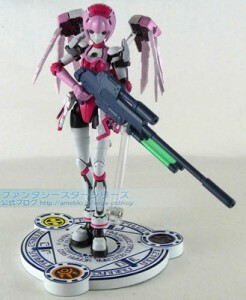 It even comes with a Shato mag. This kit is coming out in May of this year. Phantasy Star Eternal Planets added new Photon Arts that did not exist in PSU/PSP2 series. 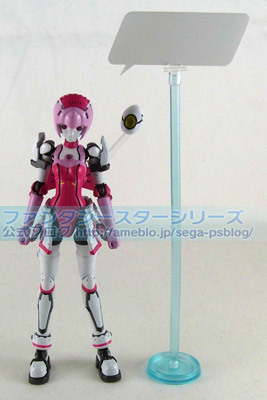 Sakai updated this morning with the third revolution for Phantasy Star Online 2, which is its ultimate character creation! But instead of going through the whole thing, lets jump to the important parts highlighted in the post. Phantasy Star Online 2 characters have a one piece suit, stats are no longer tied to the outfit like in the first alpha test. 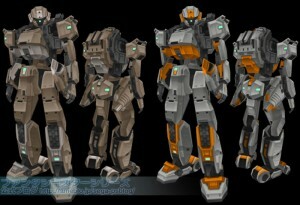 Instead, units, which you attach to your arm, back, and legs, will improve the defensive stats for the character. If you like the unit’s stats but you aren’t so happy with the way it looks on your character, you can turn off the graphics displaying your units. Cast bodies consist of their Head, Arm, Torso, and Legs, and you can now change each part through morphing which was a feature the first alpha test did not have. Today’s porori images are the improvements to the icons which were a big complaint in the first alpha test. He’ll only show a small portion of the changes for today. The icons in the first alpha test were difficult to understand and identify from one another. They changed the icons by removing the weapon abbreviation, then made the backgrounds more simplistic so you can see the icon’s representation more clearly. The icons for weapons, units, costumes, etc, were all redesigned to make them more distinct in each category. Photon arts, skills, and consumption item icons are now redesigned to be closer in direction towards Phantasy Star Online. 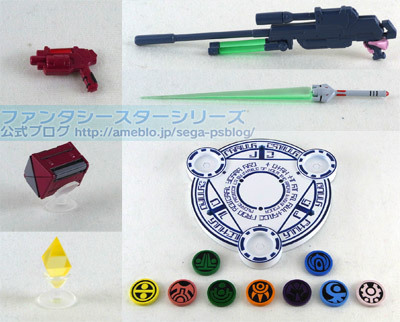 You can feel the presence of PSO in these icons. By giving the icons a more simplistic style, you can easily point out the photon art’s effect and what weapon category they each belong to. Ranged weapon photon arts like the “Grenade Shell” in the screenshot above have a blue background on them. Skills that you can add to the sub-palette are now more distinct from photon arts, in that, skill icons will have a brighter background. A brand new Die-Cast Metal Elenor toy has been announced and will be displayed at Bandai’s Tamashii Nation 2011 event. This is only a prototype model. This Elenor has different accessories and mags too. 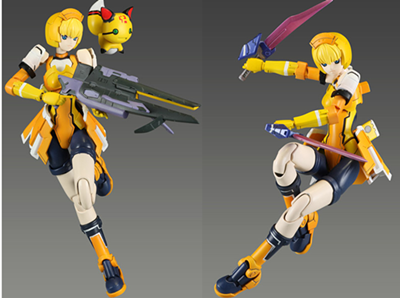 Saber and Red Handgun, item box and even meseta. And look a chat box! It is a different molded approach from the Ver. APSY models. The model and the accessories may go under some revisions before its public release.